Toni Kroos is one of the few holdovers from the Germany squad that won the 2014 World Cup as they take on Holland in European Championship qualifying as +190 underdogs. European Championship qualifying is in full swing with some excellent soccer matches scheduled for the weekend including Germany trying to pull themselves out of a tailspin versus the Netherlands. 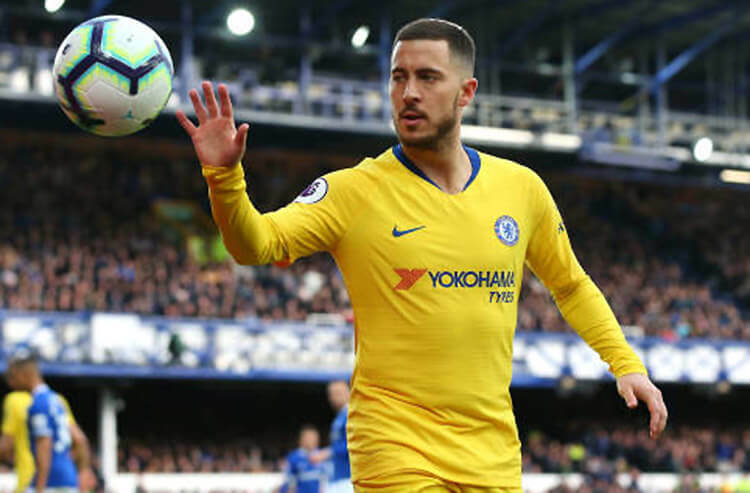 We have the betting notes and tips you need to help you kick your way through the odds on the pitch. Spain are expected to cruise to top spot in Group F competition at qualifying for the 2020 European Championships – and their quest begins Saturday as they kick off group play against visiting Norway. Even with the Norwegians already assured a playoff berth and expected to be in the mix for a top-two spot in the group, the visitors are overwhelming +1800 longshots against a Spanish side (-550) installed as the -600 favorite to finish atop the ledger. Norway has earned three victories and a draw over its previous four international matches, allowing just one total goal over that span. Group F might be Spain's to lose, but the battle for second place should be an entertaining one, with Sweden, Romania and Norway all expected to battle for the No. 2 slot. And the first two teams on that list will look to get a leg up as they face off Saturday at Friends Arena in Solna. The host Swedes have already earned a spot in the playoff thanks to a strong Nations League showing and went all the way to the quarterfinals at last summer's World Cup in Russia, and are comfortable -125 favorites against a Romanian side (+425) that has just 28 international goals on its entire roster. The top two teams in Group C will waste no time getting acquainted, as Holland host Germany on Sunday in what is expected to be the marquee game on the weekend Euro 2020 qualifying schedule. The Germans are the -163 favorites to secure top spot in the group, but find themselves in a tailspin with three losses and three draws in their previous six international games – including a 1-1 draw with Serbia earlier this week. And they're +190 underdogs against the Netherlands (+125), who have identical +125 odds of claiming the group after getting the tourney started with a 4-0 rout of Belarus on Thursday. Welsh soccer fans have only fond memories of their side facing Slovakia as the teams renew hostilities Sunday at Cardiff City Stadium. Wales kicked off the 2016 Euro qualifying with a 2-1 win over their Slovak opponents, and rode that momentum all the way to a semifinal appearance in the main event. Four years later, the Welsh side carries 150 odds of finishing top-two in the group and is a +100 favorite against Slovakia (+300), which kicked off the tournament with a convincing 2-0 triumph over Hungary and is looking for its first victory in Cardiff since a 5-1 drubbing back in 2006. The Romanians will almost certainly focus on keeping Sweden's talented offense at bay – and they're well-prepared in that regard, having gone below the total in 12 of their previous 14 European Championship games; they also blanked Sweden 1-0 in their prior meeting nearly a year ago. The Under for Saturday's game is set at -188, with the under-1.5 option at +162. Finland isn't expected to put up much a fight in their Group J encounter with a formidable Italians side on Saturday, but they'd be fortunate just to come away with a goal. Italy have blanked the Finns in each of their previous four international encounters, outscoring them 7-0 in the process. The Italian clean sheet is priced at -225, while a two-goal Italian winning margin is +275. It could be hard to find value in a matchup as one-sided as Saturday's Group J encounter between host Lichtenstein and Greece. The visitors have blanked their weekend opponent in three straight meetings, while Lichtenstein has gone without a goal in 11 of 13 Euro matches. The best bet might be a Greece-Greece half-time/full-time combo, which is priced at -200. Can Norway keep Saturday's pivotal encounter with Spain close? It would certainly be consistent with their recent European Championship performances – the Norwegians have dropped three straight games in the competition, all by one goal. A 1-0 Spain triumph is priced at +550, with a 2-1 win at +700 and an unlikely 3-2 decision at +2500. Russia are reeling after dropping a 3-1 decision to Belgium in their Euro 2020 qualifying opener – their third consecutive loss in the tournament, and the third straight time they've lost both the half-time and full-time result. Bettors feeling adventurous can get the underdog Kazakhs on the half-time/full-time double at an intriguing +650 against visiting Russia on Sunday. One thing about Wales-Slovakia games: They produce an awful lot of offense. The teams have faced off three times since 2006, and have seen a total of 16 goals scored in those three contests. And while only one of those contests has come in the past 12 years, there should be plenty of interest in the Over, which is set at +140. 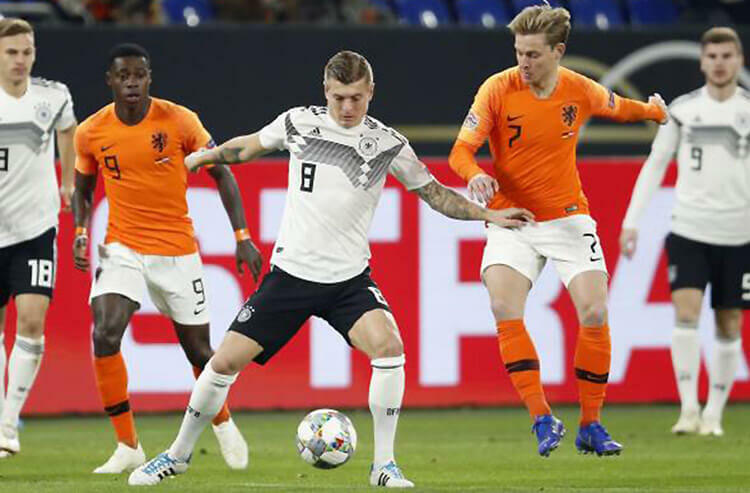 The Netherlands and Germany should generate plenty of scoring chances – and that's music to Over bettors' ears, especially when combined with these teams' recent history. The renowned soccer nations have gone Over the 2.5-goal total in five of their past six meetings, and are installed at -138 to extend that trend on Sunday. European Championship games involving Poland have been low-scoring affairs as they look to remain unbeaten in tournament play Sunday against visiting Latvia. 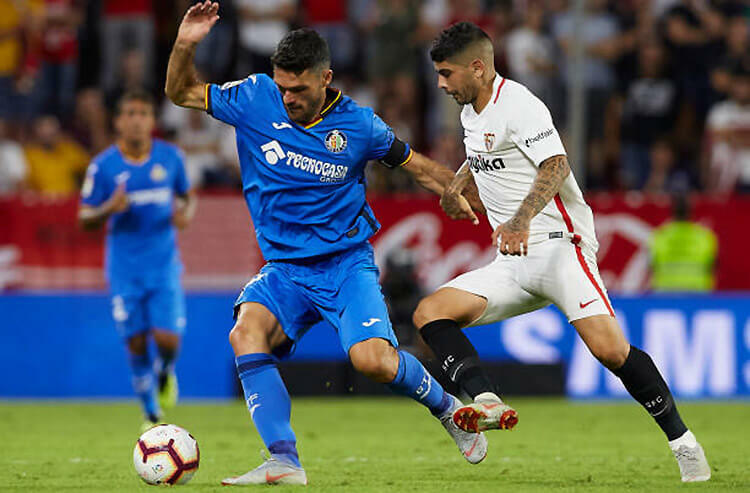 The hosts have gone below the number in each of their previous six Euro matches, but at -1200 to win, oddsmakers see this one ending up as a rout – and have placed a tempting +170 on the Under. England impressed in its Euro 2020 qualifying opener, but will be without a key member of the roster for Monday's match against Montenegro. Dier incurred a muscular injury in Friday's win over the Czech Republic, and is expected to return to his club team, Tottenham. The English are massive -182 favorites against host Montenegro (+500).